AUSTRALIAN wool prices fell further this week, impacted by end-market price resistance, processor finance issues, quality and exchange rates. AWEX senior analyst Lionel Plunkett said the Micron Price Guides this week reduced by 70-160 cents, pushing the AWEX Eastern Market Indicator down 78 cents to 1776c/kg clean. “The EMI has now fallen for four consecutive weeks, losing a total of 247 cents over this period and is now 340 cents away from its August peak of 2116 cents. “As in previous weeks, the fall in price has been met with firm seller resistance,” he said. Brokers passed in 20.9 percent of the national 32,189 bale offering, despite this being 3595 fewer bales than the previous week. Mr Plunkett said 8.4pc of the offering was also withdrawn prior to sale, giving a clearance rate for the week of only 70.7pc. Mr Plunkett said the 32,189 bales offered was now down 15.2pc on the number of bales offered at this time last season. The EMI in US$ fell a further 29 cents to US1293c/kg clean, as the A-US$ exchange rate rose US1.49 cents to US72.78 cents. “When the sale opened, it was immediately apparent that there was a distinct lack of buyer confidence. “Good style wool, with favourable additional measurement results, were attracting spirited bidding and as a result were not too heavily discounted,” he said. Mr Plunkett said crossbred fleece wool prices also fell this week, but not to the same extent as their Merino cousins. He said the oddment sector continued its dramatic fall. “Prices for locks, stains and crutchings were generally reduced by a further 30 to 90 cents. “This pushed the three carding indicators down by an average of 63 cents,” he said. 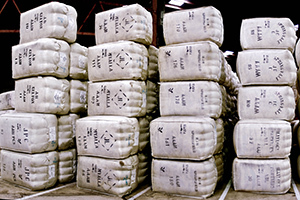 Elders southern zone wool manager Lachie Brown said auction market factors this week included price resistance from brands and retailers, cash flow issues for some Chinese processors and the Australian dollar rising almost US1.5 cents during the week. He said prices for medium Merino wools are well above rates at this time last year. “But he said prices for finer wool, because of that oversupply of lesser testing types impacted by drought, were really pulling the regional indicators back. “The nature of the offering is forcing that two-tier market, particularly at the fine end, where you’ve got the European types as good a money as two to four weeks ago, versus the lesser types destined for the Chinese market that are dropping away in value considerably to the point where they are worth as much as a 21-22 micron wool now,” Mr Brown said. “It is looking like we are starting to see some light at the end of the tunnel. Mr Brown said spring is notorious as a period of lower demand and this has been the case in the last 3-4 weeks. Next week, there are currently 39,883 bales rostered for sale in Sydney, Melbourne and Fremantle.